Valued at $6.9 billion, the pet superstore offers an omnichannel experience of thoughtful, personalized messages unique to each shopper and more importantly, their pet(s). 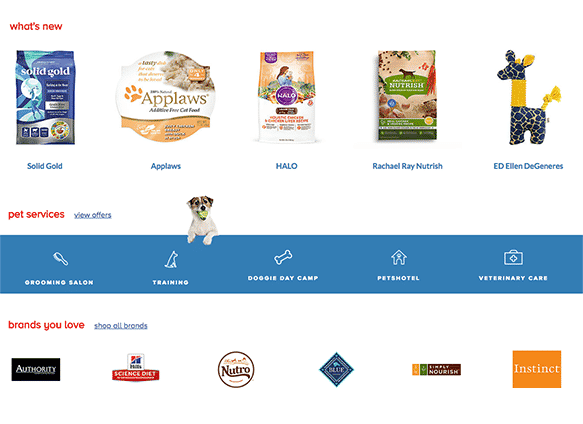 PetSmart’s onboarding process accounts for the type, breed, gender and other information of a customer’s pet for its Pet Perks Club and caters content, attribute-based product recommendations and populates a personalized ‘what’s happening today’ section of the website with useful tutorials and tips. PetSmart announced that it’s planning to expand its in-store events, called PetSmart Parties, Sample Saturday and Camp Critters, as the brand continues to focus on brick-and-mortar revenue. In store, PetSmart utilizes mobile beacons to trigger messages related to products you’ve browsed or relevant content about your pet. The brand has much room to improve in email marketing, scoring the lowest out of any Top 25 retailer. 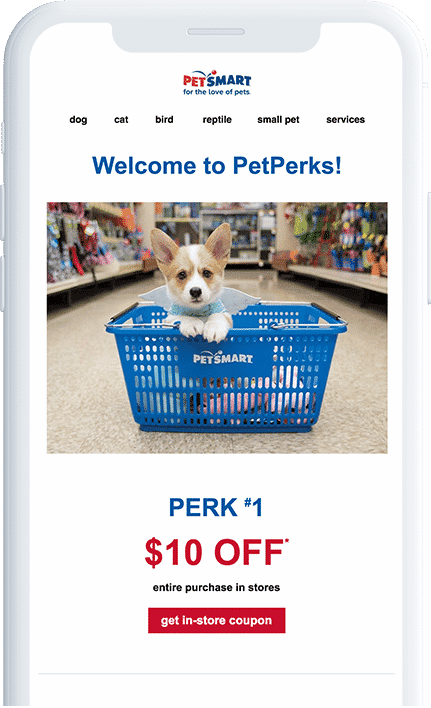 We love PetSmart’s Pet Perks rewards program. They get personal, using first names in email and sending relevant messaging to members including curated products for their pet and the ability to order and pick up in-store in one hour or less. PetSmart’s website is well-equipped with advanced product filtering. The brand incorporates content right onto the homepage with a ‘what’s happening today’ section and videos about potty training, nutrition, and doggie day camps to keep consumers coming back between purchases for ongoing education designed to boost brand loyalty. 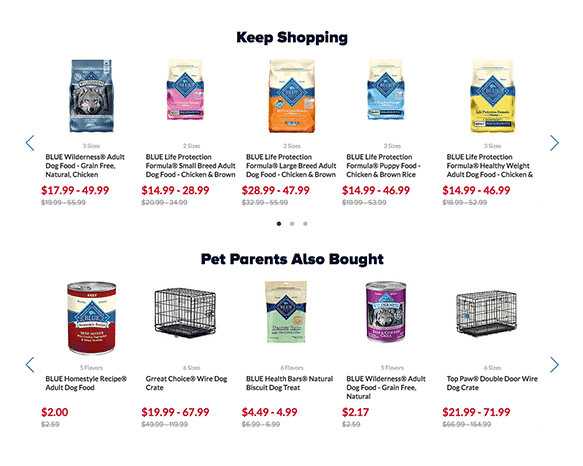 PetSmart gets their recommended products front and center with “Pet parents also bought” recommendations. They are on target and on-brand with fun copy, relevant items and thoughtful suggestions for your pets specific breed, weight and needs.